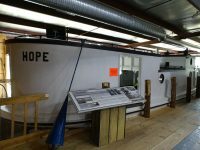 Visitors have a rare opportunity to explore, inside and out, the 45-foot-wooden fish tug Hope. The tug was built in 1930 by Sturgeon Bay Boat Works and owned by the well-known Stanley Voight fishing family. Watch an intriguing video that captures the tug’s final fishing trip before it was retired and donated to the museum in 1992.